A site built in neatComponents is made up of 'components'. Each component is roughly analogous to a page in a website, and - for simple components - the correlation is direct. You need a page somewhere, so you insert a component at that point. The simplest building block of a neatComponents website is the user editable Page. In its most basic use it provides a simple page to receive text, images and tables that look like any other website page. Pages are also editable in their own right, but Pages can also be used as the receptical for other information that is 'Embedded' in them - this is how the data from forms and queries gets displayed on the site. 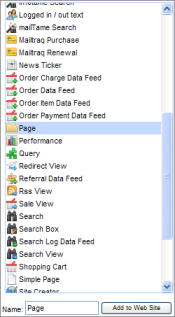 Simple Pages can be added directly to the site-tree, but usually are added to Pages to form branches to the site-tree. The branches make it easy to use the inherent hierarchical navigation system, and as the Style and Permission characteristics of a Section are inheritable they greatly reduce the amount of configuration required. Pages are manipulated using an online Text Editor that gives all the normal edit controls, as well as an Image Manager, Link Manager and direct access to an HTML view of the page. Every component has its own Behavior Editor, which gives control over Styles, advanced configuration Settings, and component by component access Permissions - direct from console-like dialogs. Where particular components do more involved things, (for example, the Forum component), they can be thought of as providing not just a single page, but an entire application. We like to use analogies when describing complex things, and the best analogy we've come up with for neatComponents is that of a building. The website is the building, and it's made up of various shaped components - the bricks, windows, guttering, etc. Different components with different tasks, that can be fitted together in all sorts of ways depending on what you want to do in it. Whether your role is that of builder, architect or client, understanding what the various components are capable of, and how they can be fitted together will help make the project a success.